FOX SportsMarlins starter Jose Urena beaned Ronald Acuna Jr. with the very first pitch of their game on Wednesday, prompting the benches to clear and Urena’s ejection from the game. Atlanta Braves rookie Ronald Acuna Jr. had hit three straight leadoff home runs off of the Miami Marlins. To prevent him from getting a fourth, Marlins starter Jose Urena beaned Acuna with the first pitch of their game on Wednesday, prompting the benches to clear and Urena’s ejection from the game. Acuna would attempt to return to the game but was removed soon after the incident. The Miami Marlins were fed up with Ronald Acuna Jr. Through the first three games of the Marlins four-game series against the Atlanta Braves, Acuna had cemented himself as the hottest slugger in baseball, hitting a leadoff home run in all three games to lead the Braves to victory. On Wednesday night, Marlins starting pitcher Jose Urena made certain that Acuna wouldn’t hit a fourth straight leadoff home run against his team – beaning him with the first pitch he threw. The pitch hit Acuna in the elbow, sending him to nurse himself on the third base line as the benches cleared and tempers flared over the apparent cheap shot. Tensions flare at SunTrust Park as Ronald Acuña Jr. is hit on the elbow with a fastball from Marlins starter Jose Urena. Urena was promptly ejected, finishing his night having thrown just a single pitch. According to ESPN Stats & Info, Urena made the most of his brief appearance – the pitch he hit Acuna with was one of the fastest he’s thrown all year. 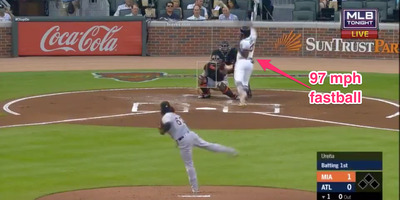 The pitch that hit Ronald Acuña was 97.5 MPH. Out of the 2,125 pitches that José Ureña has thrown this season, that's in the 99th percentile of the fastest pitches he's thrown. Acuna would attempt to stay in the game but would leave briefly after being hit by the pitch.